So I was seeing all kinds of posts about people turning deviled eggs into little chicks. I debated heavily on weather or not I thought this was cute or creepy. Eventually after much deliberation I decided they were more creepy with there little beady eyes that they were cute. I did however think the concept was a good one. 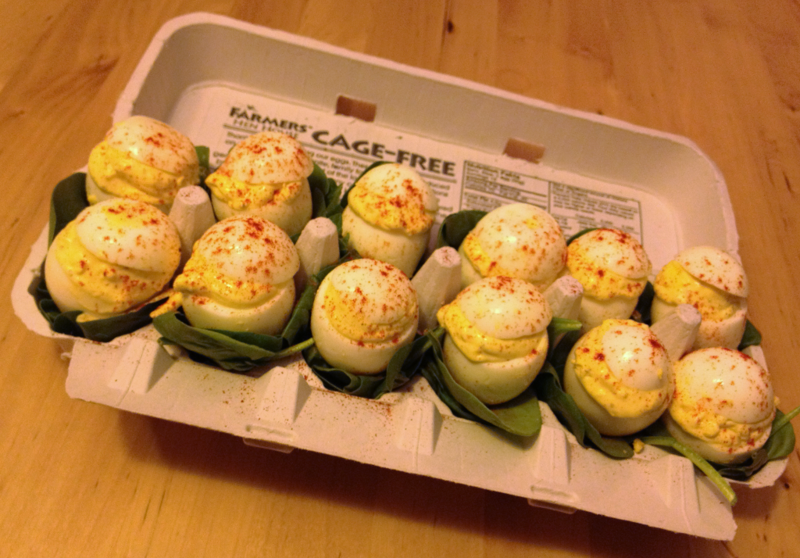 I happen to love deviled eggs, but rarely make them because they are difficult to transport just a few at a time. 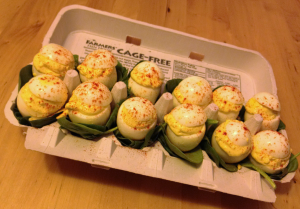 The chick concept lead me to want to stuff the eggs with the yummy deviled mixture. Fill them up and put the cap back on! There is a learning curve albeit not a huge one to making these. The big trick is what end of the egg to cut, it only took me 1 egg to realize this. The bottom or side with the yolk in it is what you should cut. Also it takes a bit of finesse to get the yolk out of the egg without breaking the white. Once you have the yolks separated from the whites put in a mixing bowl and give them a good mash with a fork. Next add the mayo, mustard and pickle juice to the mix. Mix until smooth. I put the mixture in a ziploc bag then cut one of the tips from the bag as a cheap alternative to a piping bag. Fill the hollow egg white with the yolk mixture and top off with the white you chopped off earlier. 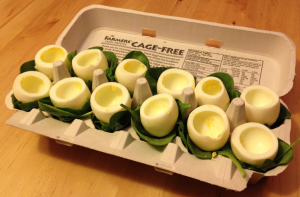 My Boyfriend gave me the idea of using an egg carton to transport and display the eggs. I put some spinach leaves in the bottom of the egg carton and they turned out beautiful. Just a sprinkle of paprika on top completes this dish. Enjoy!